I had a n important revelation at a funeral. Some people may think that is a great place for a significant revelation. Others may think that a little crazy. My sister-in-law passed away this week. As I sat among the grieving family all I could think about was how beautiful her smile is. There was a photograph placed on an easel next to the coffin showing off her spiky hair and toothy smile. She was always the life of any party and had a smile that would light up a room. As I thought about all her wonderful traits … it was like a light went off in my head. When someone… or you..share love, joy, peace, patience, humbleness, grace, goodness, mercy, etc to another you are showing off God. All good things come from Him. He shows up everywhere because He longs for you to know Him. He shares His goodness because He loves you. He chases you in every smile, every sincere hug, in every kind word. 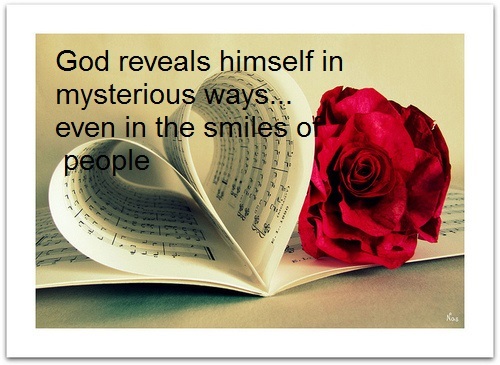 He reveals aspects of who He is so we can know Him more. I thought of all the times I had the joy of spending time with her and I am thankful. I am thankful for the life she courageously lived in love and strength. I am thankful that I got a glimpse of my Heavenly Father in her. It’s pretty cool to think that we represent Jesus to others. But what is greater is that we carry His traits not only as a reflection of who God is but also as a part of who we are. I hope I am sharing my heart well enough in words to capture the weightiness of this statement. We are made in His likeness and we carry His traits in us. We are not just a mirror to reflect Him but we are made like Him. Can you imagine the Creator of the universe so pleased to place all His goodness in us just so we could know Him better as we share our lives with others. I got a glimpse of how loving, how joyful, how wonderful my God is through the attitude and smile of lovely woman named Darlene. Remember, as you wake up to another day, that you are part of God’s master plan to share Him with those you meet today. Smile, laugh, be patient, be kind, and show goodness, grace and mercy to others. Heavenly Father, thank you for allowing us to show YOU to others. Thank you for the fruits of your Spirit that are shed abundantly in our hearts as we serve you and come to know you more. I pray that we will seek out those fruits in others and that we would show these fruits to all people around us. Give us strength to do so. Forgive us for all those times that we choose not to show the fruits of YOUR Spirit and chose instead to represent the kingdom of the the enemy. Forgive us now as we choose to forgive others that have done that to us. Help us to remember daily that we represent you, Lord. I ask you to remind me even in hard times to show these fruits and represent you well. Help us to represent you in love and in joy. In Jesus Name, Amen. Sometimes I can be so hard on myself. I seem to spend too much time meditating on any wrong thing I ever did or ever thought. I think of all the skills I don’t have. I dwell on how I am not as good as I wish I was. I finally realized that those thoughts are not from God. The enemy condemns. God convicts. His conviction leads to a repentant heart fully trusting in Him. Condemnation leads to loneliness alienating us from God and people who love us; and causes us to run from God rather than to Him. Here is a story I have heard which explains how we can feel like we have let down God but what may be our weakness God uses in His strength. A water bearer in India had two large pots, each hung on each end of a pole which he carried across his neck. One of the pots had a crack in it, and while the other pot was perfect and always delivered a full portion of water at the end of the long walk from the stream to the master’s house, the cracked pot arrived only half full. For a full two years this went on daily, with the bearer delivering only one and a half pots full of water in his master’s house. Of course, the perfect pot was proud of its accomplishments. But the poor cracked pot was ashamed of its own imperfections, and miserable that it was able to accomplish only half of what it had been made to do. After two years of what it perceived to be a bitter failure, it spoke to the water bearer one day by the stream. “I am ashamed of myself, and I want to apologize to you.” “Why?” asked the bearer. “What are you ashamed of?” I have been able, for these past two years, to deliver only half my load because this crack in my side causes water to leak out all the way back to your master’s house. Because of my flaws, you have to do all of this work and you don’t get full value for your efforts,” the pot said. The water bearer felt sorry for the old cracked pot and in his compassion he said, “As we return to the master’s house I want you to notice the beautiful flowers along the path.” Indeed, as they went up the hill, the old cracked pot took notice of the sun warming the beautiful wild flowers on the side of the path, and this cheered it some. But at the end of the trail, it still felt bad because it hadleaked out half its load, and so again it apologized to the bearer for its failure. The bearer said to the pot, “Did you notice that there were flowers only on your side of the path but not on the other pot’s side? That’s because I have always known about your flaw, and I took advantage of it. I planted flower seeds on your side of the path, and every day while we walk back from the stream, you’ve watered them. For two years I have been able to pick these beautiful flowers to decorate my master’s table. Without you being just the way you are, he would not have this beauty to grace his house.” Each of us has our own unique flaws. We’re all cracked pots. But if we will allow it, the Lord will use our flaws to grace His Father’s table. In God’s great economy, nothing goes to waste. So as we seek ways to minister together and as God calls you to the tasks He has appointed for you, don’t be afraid of your flaws. Acknowledge them and allow Him to take advantage of them, and you, too, can be the cause of beauty in His pathway. Next time you start feeling useless, down, like nothing you do is right…remember that we are all cracked pots.